How rough was 2018? Through the first three quarters of the year, the S&P 500 was up 10.6% – yet the index’s full-year return was -4.4%. There have been several reasons for volatility’s return, most notably geo-political instability, trade wars, a presidential Twitter account, plummeting oil prices and the fact that the bull market was already starting to feel longer than usual. Looking ahead through 2019, I believe equity volatility will remain elevated due to the lagging impact of monetary tightening and the concomitant flatter yield curve, coupled with the potential for slower corporate profit growth. What investors should try to remember, however, is that volatility is the normal state of affairs for equities. On average, the U.S. equity market would see declines of 5% or more about three times a year. In this context, 2017 was the clear outlier, with not a single decline of 5% or more – in fact there were only four days when the market dropped more than 1%. In 2018, there were five periods when the S&P 500 declined 5% or more, and 32 days when the index’s returns were worse than -1%. Over time, market returns tend to offer calm, smooth gains in some periods, and more challenging, volatile returns in others. 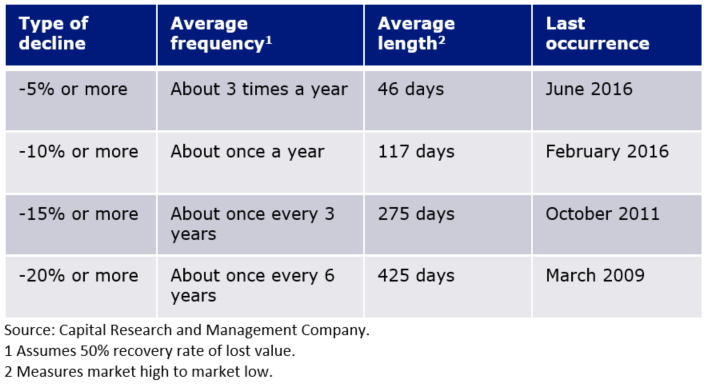 These volatile periods can have a substantial impact on the long-term performance of equity portfolios because there are typically greater differences between the relative winners and losers during these periods. Passive investors who choose the S&P 500 as their benchmark for U.S. equities will experience the downs as well as the ups offered by this strategy. Fortunately, though, there are alternatives for investors who would rather limit their exposure to such instability. Low volatility ranks among the academically established investment factors that drive portfolio performance. The S&P 500 Low Volatility Index consists of the least volatile quintile of the standard S&P 500 Index, rebalancing on a quarterly basis. Historically, this approach has helped to limit declines during periods of heightened volatility, while maintaining exposure to the equity market. The fourth quarter of 2018 serves as an example. 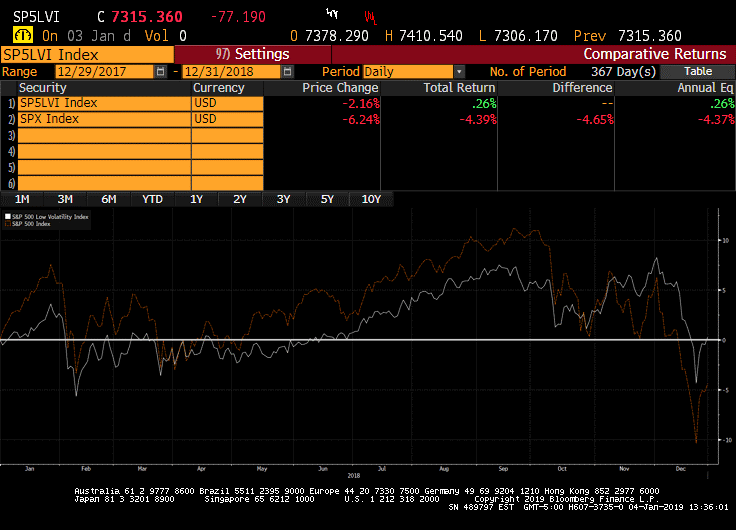 During this period, the return on the S&P 500 was -13.8%, while the S&P 500 Low Volatility Index returned -5.1%. Over the course of the full year, the S&P 500 returned -4.4%, while the S&P 500 Low Volatility Index finished with a positive return of 0.3%. It is, of course, virtually impossible to predict a resurgence of volatility, so it may be prudent to consider a low-volatility strategy as a core strategic holding. Learn more about low-volatility investing on Invesco.ca. Source: Morningstar Research Inc., as at December 31, 2018. Currency: USD. All data is from Bloomberg L.P. as at December 31, 2018 unless stated otherwise. S&P®, S&P 500®, and S&P 500 Low Volatility Index® are registered trademarks of Standard & Poor’s Financial Services LLC and have been licensed for use by S&P Dow Jones Indices LLC and sublicensed for certain purposes by Invesco Canada Ltd.